Live in Omaha Nebraska for the first time. On Tribute to Bob Marley 70th Birthday USA Tour. This is a do not miss show as they will be performing their hit songs. The Mighty Diamonds— was formed in 1969 in the Trenchtown area of Kingston, Jamaica (the home of Bob Marley). They are the most consistent and long-running vocal trio in Jamaican musical history and for the past 41 years have been entertaining and educating the world with their sweet harmonies and conscious lyrics. If you like Reggae, Ska, Jazzy sound- you will never be disappointed by the amazing Legendary Group. 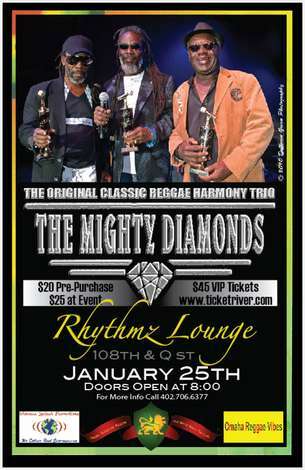 Doors Open at 8pm- Opening Band - Rhythm Collective at 845pm and Mighty Diamonds on Stage at 10pm.